We’ve been trying out Question Quest for the last few weeks at Cambridge English. We love AGO, the UNO-like simple English question game, and David Lisgo’s Switchit card games. When I saw Question Quest’s website I was extremely interested. It seemed like it would appeal to our teenage learners and complement our existing card games so I ordered a copy immediately. Once it arrived I was impressed with the production values. 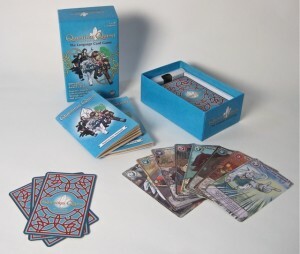 The game is very attractive, with incredible artwork, quality materials, and a sturdy box. This is a very promising resource. We normally do some kind of game or activity in the last 5-10 minutes of class, so found that Question Quest did not quite fit in that time. However, we were able to adapt the game (teacher asks the questions to students, playing without the conversation strategy cards, etc.) to fit the shorter time. We also took some time and played some full games. Lots of fun and the students are practicing useful conversational gambits. Overall I recommend Question Quest to teachers of teenage or young adult students (although it would certainly work with the right group of adults too). It’s an attractive and versatile resource. A single pack is a very reasonable investment for a small classroom: teachers with larger classes would need one set for each group of up to 4-6 players. Has anyone else tried this game? I’ve bought 5 sets, and use it regularly, about once every two weeks or so with a low-intermediate university oral communication class. I find it’s a very good warm-up to get students talking in English. I always set my timer to go off at the 20-minute mark, which makes it easy to end without needing to wait for all cards to be used up. I think 15 minutes might be long enough, but definitely not less than that. I agree that it does take a bit of explaining at first, but once they get it, the students really enjoy the strategy aspect. It makes the game winnable even for lower ability level students, which is nice. I’ve only used it with one group in eikaiwa classes. How did you handle explaining the rules? Did you hand out the rulebooks too?